Research suggests that more than a third of Scotland’s drivers ‘rush through town’ if they’re late for work, with nearly one in five admitting to speeding. In a survey published by the Scottish Government and Road Safety Scotland to mark the launch of a new vulnerable road user campaign, 58% of respondents admitted to ‘taking risks when travelling in built-up areas’ – including travelling over the speed limit (19%) and jumping amber lights (19%). 5% also admitted to travelling on ‘autopilot’ every day – not paying ‘full attention to their surroundings or other road users’. 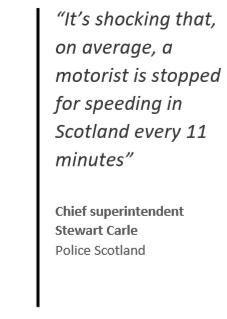 The new campaign, ‘In Town, Slow Down’, calls for all road users in Scotland to travel at appropriate speeds. 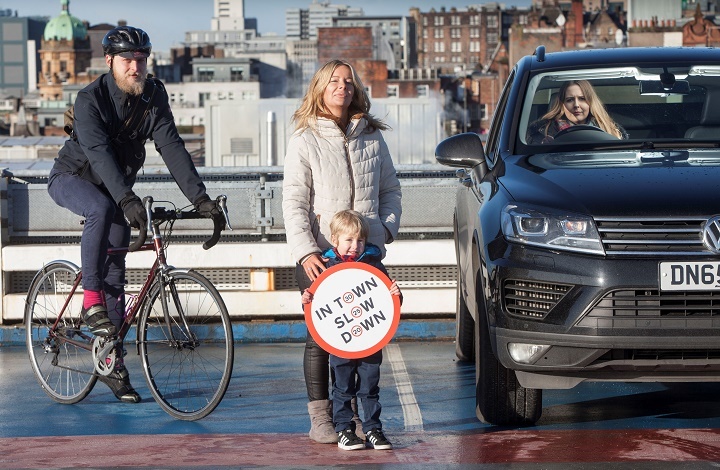 Backed by Living Streets Scotland, Cycling Scotland and local authorities, the campaign is designed to unite road users and create a greater sense of shared responsibility. The campaign TV advert highlights the frequency with which motorists are apprehended for speeding on roads across Scotland. Transport Scotland figures show 96% of accidents involving pedestrians happen in built-up areas, with most casualties occurring between 4-6pm on weekdays and 1-3pm on weekends. Humza Yousaf, Scotland’s minister for transport, said: “It’s important drivers and riders travel at an appropriate speed for the environment and the conditions, especially in built-up areas where there are many vulnerable road users. Chief superintendent Stewart Carle, Police Scotland’s head of road policing, said: “Reducing the number of people killed or seriously injured on our roads is a shared responsibility for all agencies and road users. Hapless users? Why not call them Hapless victims. It appears to me that it is not the Highways to blame. It’s not an educational problem as many of these driver know that what they are doing is wrong. They readily admit to it. However it may be a case of a lack of deterrent and punishment that may allow this problem to escalate. That enables some so minded drivers to act in an unlawful way. It would be further evident if asked whether they considered what they are doing as being dangerous, some would but the vast majority would not consider their actions to be so. They would possibly defend their actions by stating that in the main everyone does it from time to time. As if that makes it right. It’s the vast majority of drivers that use our highways correctly that makes them work and those that don’t bring it into disrepute. There are no doubt some highways or parts of the highway that need tweaking or corrections made and there are already organisations that would look at the picture and make the necessary adjustments/alterations that lead to safer roads. Rather than referring to the ‘hapless’ user of the road, as one person has and – referring to the antics of these drivers as described in the news article – wouldn’t ‘hopeless’ be a better word for them? I also agree that the problem is summarised in the first three paragraphs. When new roads and new communities are being designed and built from a blank sheet of paper we should do much better in making them ‘fault tolerant’ as the Safe Systems approach recommends. But retrofitting the Safe Systems approach to millions of miles of existing road infrastructure… who has the ‘bottle’ to ask for that sort of money when so many other pressing financial priorities consume our national and local politicians time? Hugh, I agree that the problem is summarised in the first three paragraphs, but I believe they are all symptoms of poor infrastructure rather than poor human beings. Human beings are by their very nature, err, human beings. So if the infrastructure cannot tolerate the inherent and inevitable attributes of its targeted users, then we should start looking to make it fit for purpose, and stop scapegoating the the hapless users themselves! Full stop. Unfortunately, the origin of the campaign would suggest the driver attitudes mentioned are a Scotland only problem which is obviously not the case – it’s UK wide. Full marks to them however, for zeroing in on the fundamental problem, neatly outlined in the first three paragraphs of the article. Sometimes in road safety and collision reduction there is a tendency to lose sight of the obvious and get side-tracked in looking for other causes.